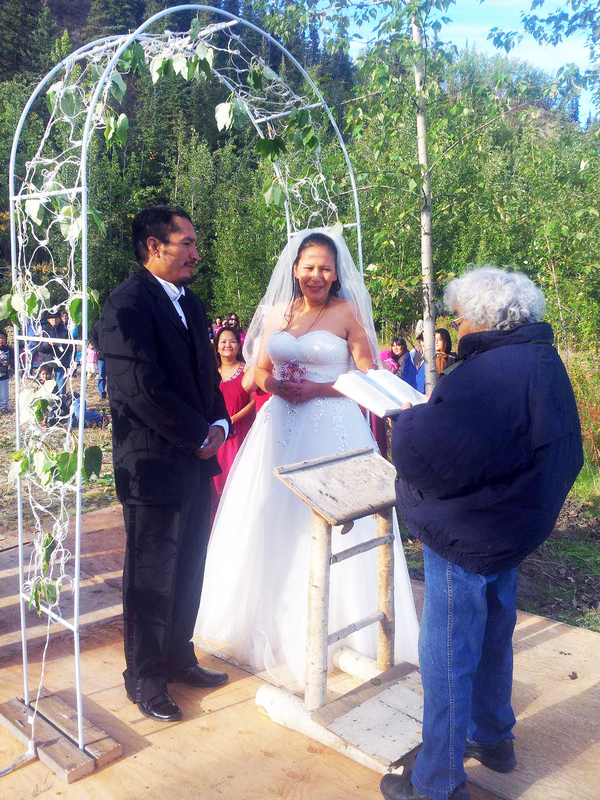 What’s it like getting married in rural Alaska? I have had several friends who got married over the summer. Unfortunately, I wasn’t able to make it to most of them. If you don’t already know, travel is very expensive to rural villages. Fortunately, I was able to join virtually via Facebook. I talked with one of my best friends, Michelle Sam, about her wedding. She and her long-time boyfriend, Russ, got married in August in Old Alatna. Old and New Alatna are located across the Koyukuk River from Allakaket in the northwest interior of Alaska. The main way to get there is by airplane. Michelle and Russ started talking about getting married about two years before doing so. They have four children. Michelle knew she wanted to get married in Old Alatna, so guests would have to get there by boat. Like many couples preparing for a wedding, coming up with the money for the wedding was a challenge. Freight for the wedding supplies and attire were expensive. Plus they had to go into Fairbanks to get a marriage license. Overall, the wedding went well. She credits the success to family and friends, including her sister and maid of honor, Dena. Her friends and relatives helped to find her dress and other supplies. She appreciates the friends who were able to travel to Alatna, including Tanya, Wes, Chris and Barbara. Her mother and others cooked for the wedding. Michelle also made it easy for her bridesmaids dress selection. Her bridesmaids could choose any style but the dresses had to be a fall time color. Decided early on who will be in the wedding to give them enough advanced notice. Delegate duties ahead of time. Many friends and family may want to help, but they need instructions and enough time. How good it felt to be getting married to the one you love! How good it felt to have the family get involved in the wedding! How good it feels to be married. How happy our parents are and the rest of our families too! How happy the village was too and how many of them made it to Old Alatna for the wedding! My sister, Tanya, was a bridesmaid at Michelle’s wedding. She exclaimed, “OMG! 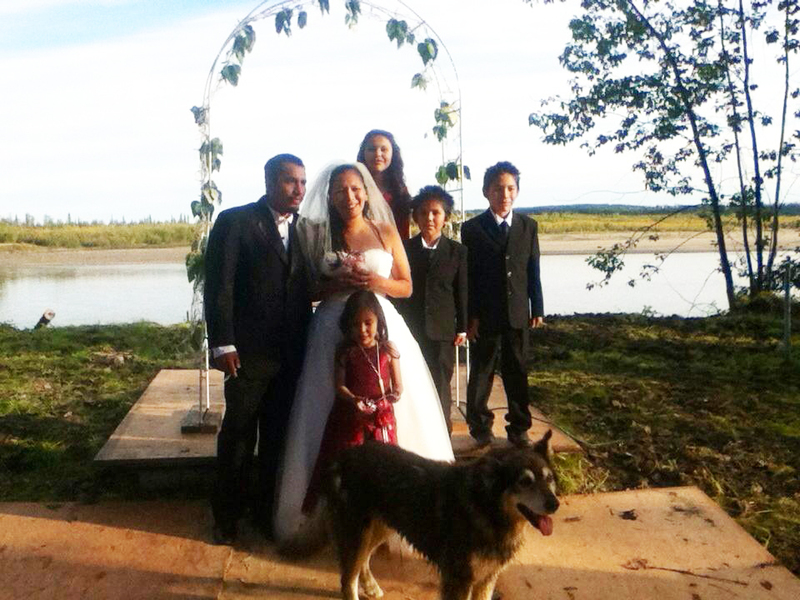 The wedding was amazing!” It turned out to be five day adventure travelling to the wedding from Huslia, which is located downriver from Alatna. Hughes is another village located between the villages. Tanya describes her adventure below. While it was an adventure getting to the wedding and back, Tanya was very happy she was able to be there to celebrate Michelle and Russ’ wedding. She gave them a big congratulations. I was able to attend a wedding in Huslia in September of Cesa and Curtis. 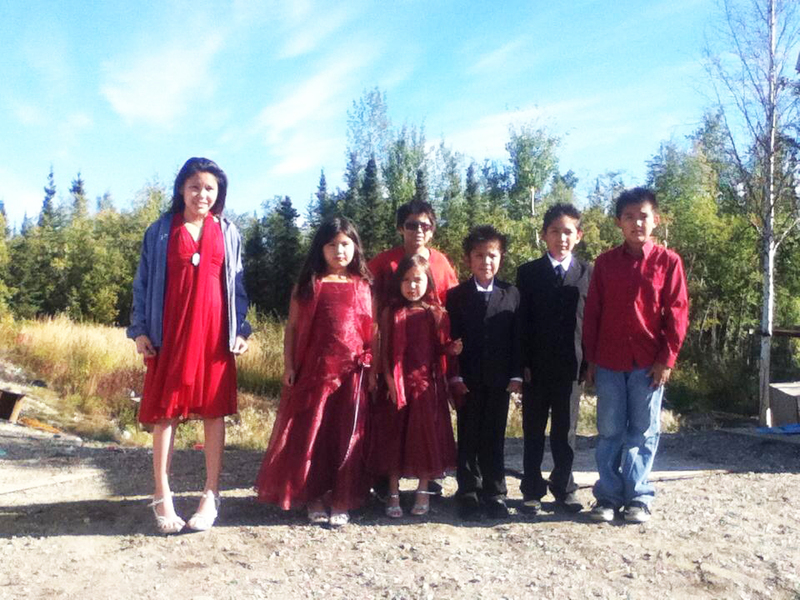 I loved seeing the way Cesa and Michelle mixed traditional wedding rituals with Athabascan touches. 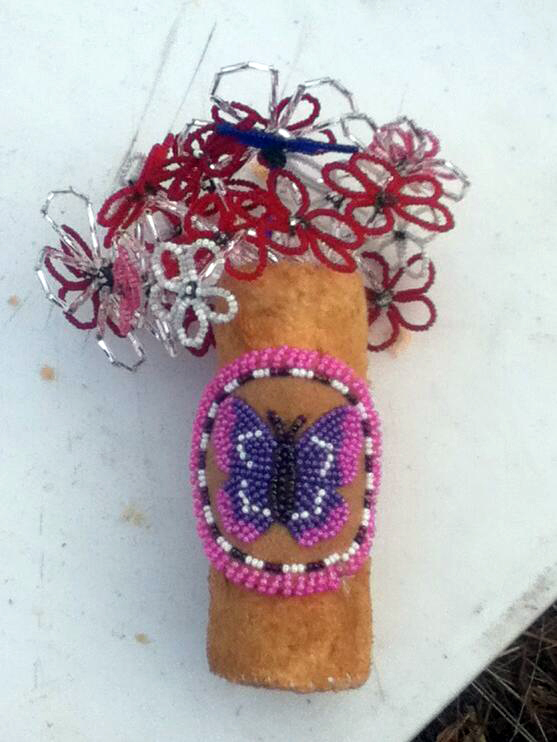 Some brides blend Alaska Native and western cultural traditions. 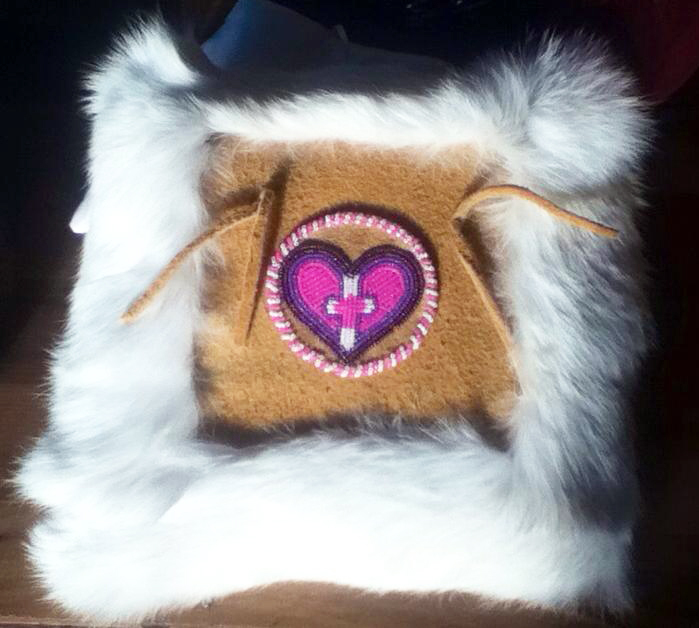 For example, the ring pillow for Michelle’s wedding was made out of moose skin with a beautiful beaded design. A long time ago, the preacher would only come one-two times per year. As a result, many couples were married at the same time. There were a few elders who had the same wedding anniversary. Nowadays, it is easier for a preacher or someone from the community to marry couples. I wish the best to couples to all of the couples who got married in rural Alaska this year! Thank you for sharing the wedding. I wish I could have made it to the wedding in person. It must have been awesome to have a wedding outside!